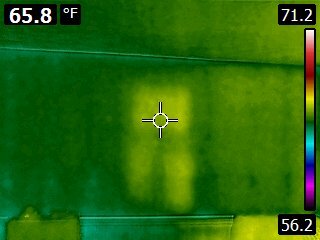 Infrared cameras are amazing tools for discovering issues that would likely go unnoticed. 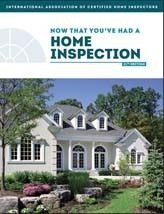 For many, the energy savings alone will recover the cost of inspection and more. 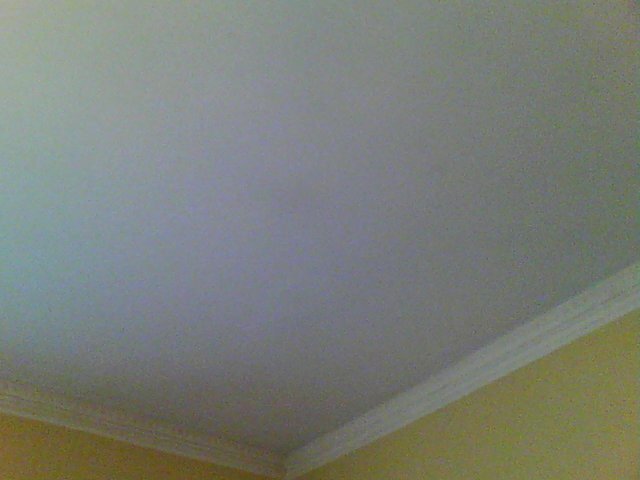 Many of the photos below were taken during actual inspections, documenting actual defects found. Our human eyes see light in what is called the visible spectrum, which ranges from red (low frequency) to violet (high frequency). Infrared light has a frequency just lower than red, placing it outside the human visible spectrum. Some animals can see infrared, assisting them in their hunting efforts. IR is used in military applications for tracking and night vision. Other industry uses include communication, meteorology, and astronomy. 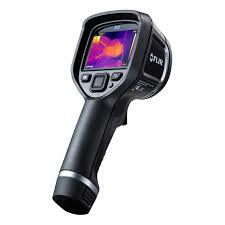 Light in the infrared spectrum is emitted by warm objects. 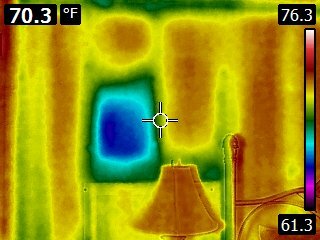 The warmer the object, the more infrared light is given off. 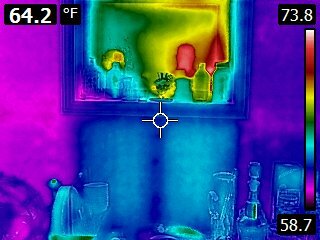 Using an infrared camera, your inspector will be able to see temperature differences on the surfaces of your home. This camera detects infrared and produces an image on its monitor that exaggerates hot and cold areas, making it easy to tell them apart. If there is a cold (or warm) spot on a surface that should have uniform temperature, this is a clue that something unusual is taking place. Roof leaks are the #1 reason for homeowner insurance claims. 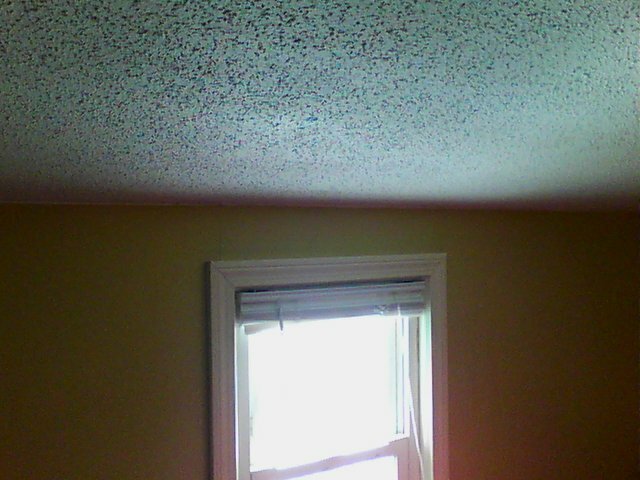 When a roof leaks, water gets in under the roof and saturates the building materials below. Since water has a high thermal mass, it acclimates to ambient temperature more slowly than its surroundings. This temperature difference makes it possible to see wet surfaces using infrared. 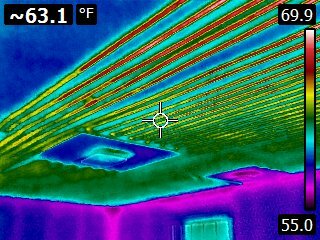 The above roof leak would have gone undetected without using infrared. 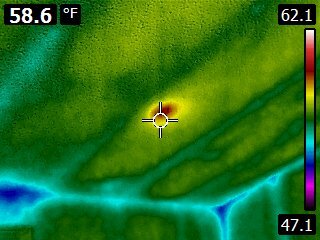 Similar to roof leaks mentioned above, plumbing leaks will also change the temperature of the surface it leaks onto, making it visible to an infrared camera. The above plumbing leak was from the bathroom shower upstairs. Radiant floor, wall, or ceiling systems operate with a coil of wire or hot water piping behind a finished surface. 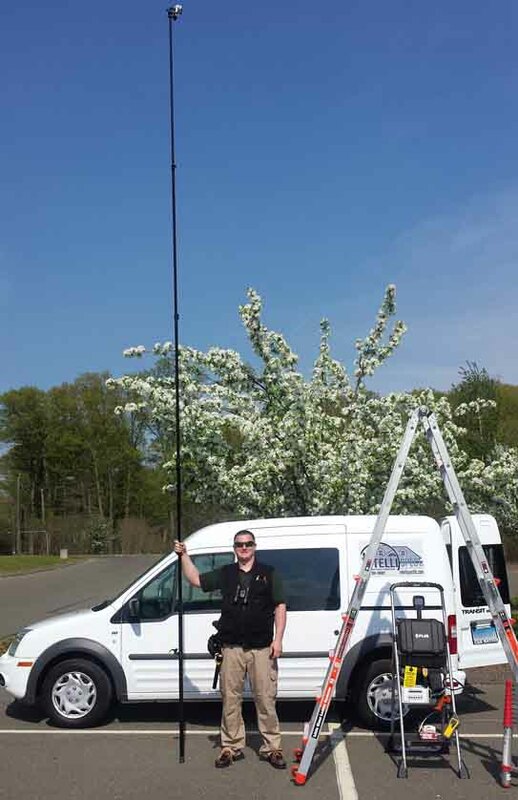 Because they are totally concealed and inaccessible, infrared thermal imaging is one of the only ways to evaluate defects or leaks in these systems. 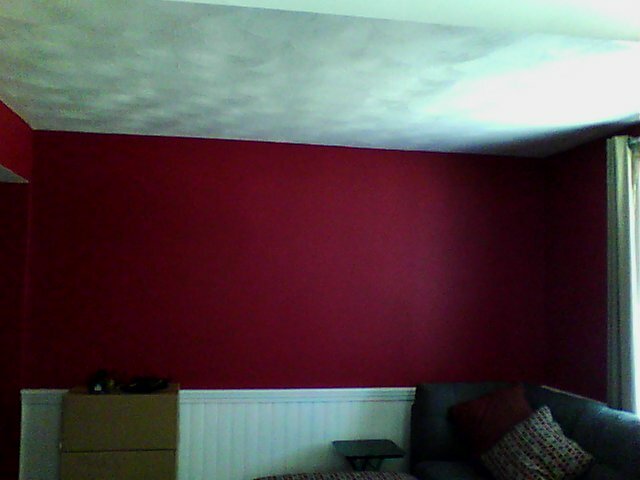 The above image shows the location of the heating coil behind the finished ceiling. Leaky ducts result in less of that warm (or cool) air reaching the areas of your home that need it. It also means that your heating and cooling systems are working harder than they should, resulting in higher energy costs and unnecessary wear and tear on expensive HVAC equipment. 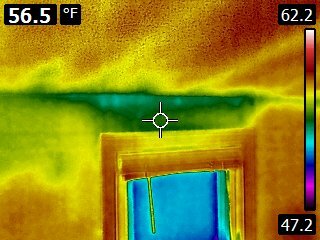 Infrared cameras are excellent tools for finding duct leaks. 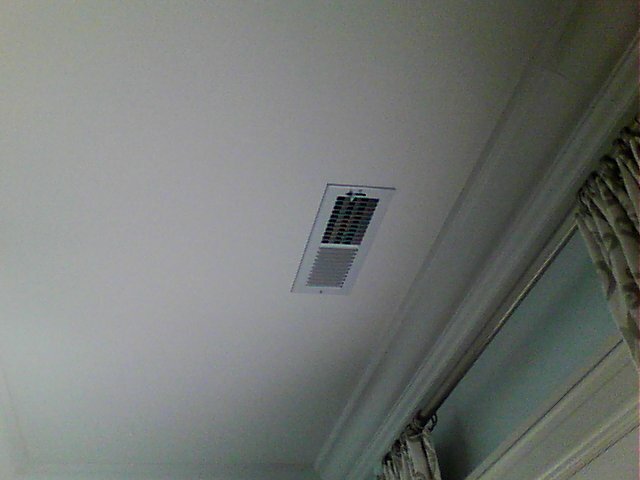 The ducts were not sealed to the registers in this home, causing some of the cool air to escape into the space above the ceiling. The type and amount of insulation in your home plays a huge role in how much you pay for your energy. Unfortunately, much of this insulation is concealed behind walls, floors, and ceilings. There are many reasons why there could be no insulation where it should exist. Fiberglass batts are often not secured well enough to stay in place over many years and may have fallen down. Blown-in cellulose, fiberglass, and wool can settle, leaving uninsulated gaps. Building contractors occasionally get lax when it comes time to install insulation, assuming nobody will ever be able to see it anyway. 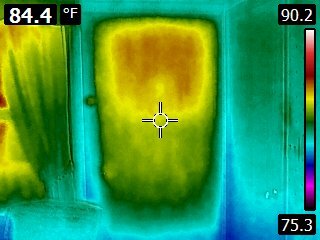 An infrared scan can identify areas lacking in insulation, allowing you to correct the problem, reduce energy consumption, and save some money while helping the evironment as the same time. 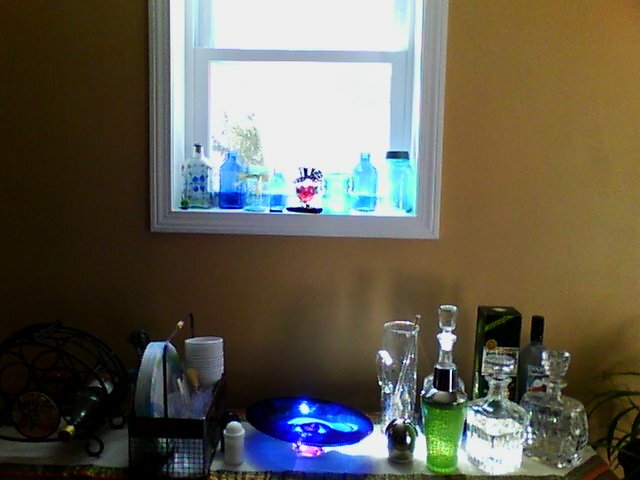 The wall below this window was uninsulated. 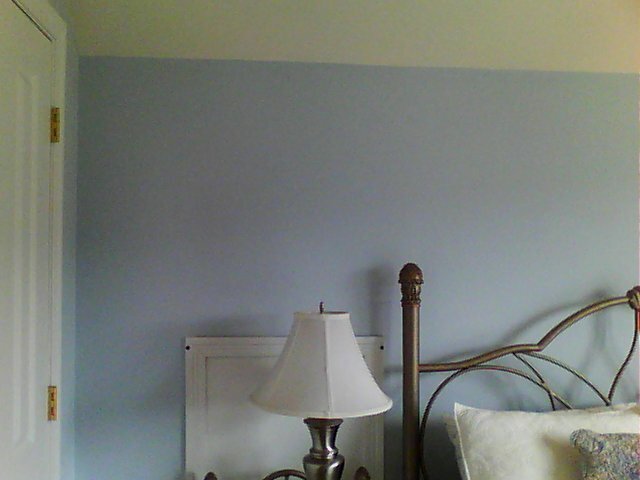 The insulation had fallen off the wall on the other side. Going along with energy savings, drafty windows and doors are also big offenders. Infrared imaging can pick these up as well. 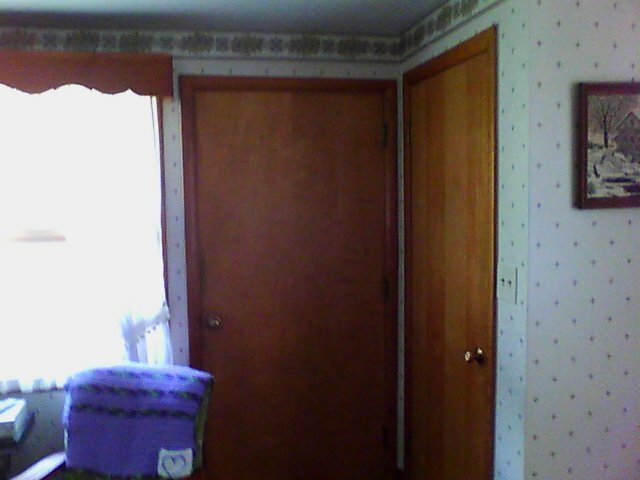 The dark edges of the door are a sign that cold air is getting in. 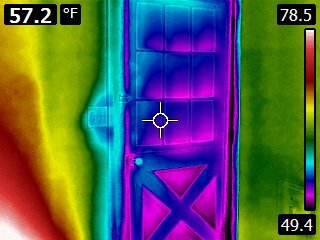 This uninsulated hollow door is a poor choice of exterior door. 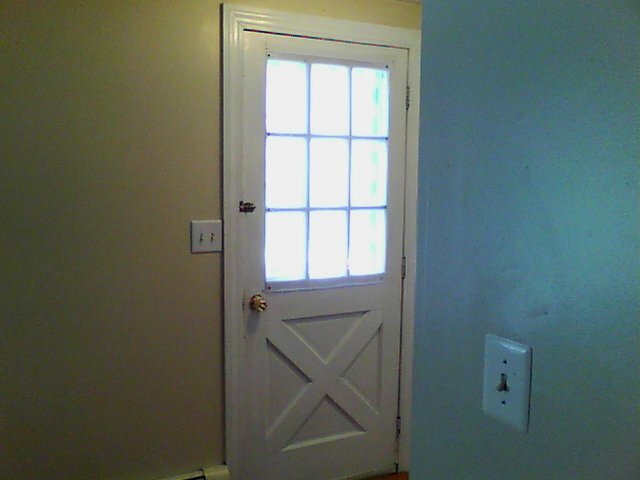 The door glows red (photo taken during the summer) as heat get conducted through it. 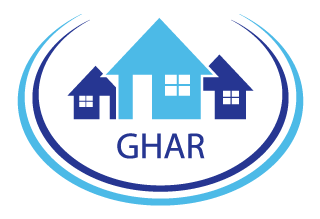 An estimated 40,000 residential electrical fires occur in the U.S. anually. Overloaded circuits are a major contributor. 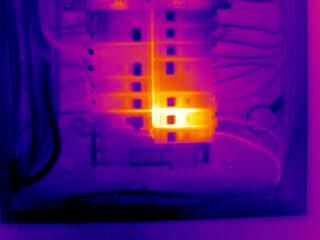 Infrared cameras can be used to find hot spots in electrical panels, which are an indication of an overloaded circuit. Hot spot found in an electrical panel. 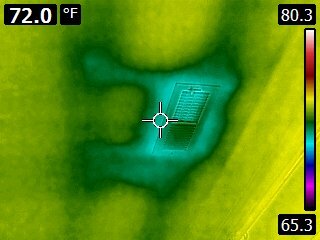 Infrared can also find countless other "oddities". 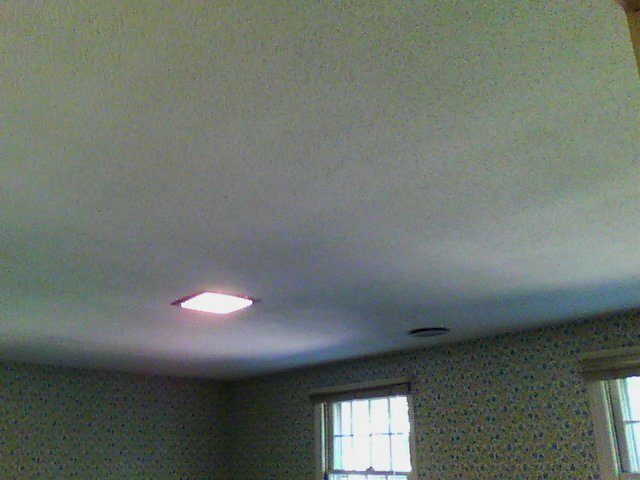 A rodent nested above a vaulted ceiling produces a warm spot that would otherwise go unnoticed. A previous homeowner had removed a window by drywalling and siding over it. 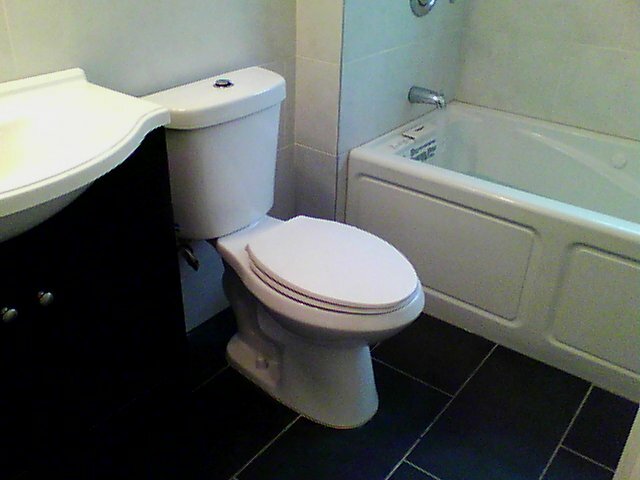 Several toilets have been found plumbed with hot water. The list goes on. On one memorable occasion we were able to help locate a homeowner's pet cat who had gotten stuck above their ceiling! Phantom window appears as an uninsulated section of exterior wall. 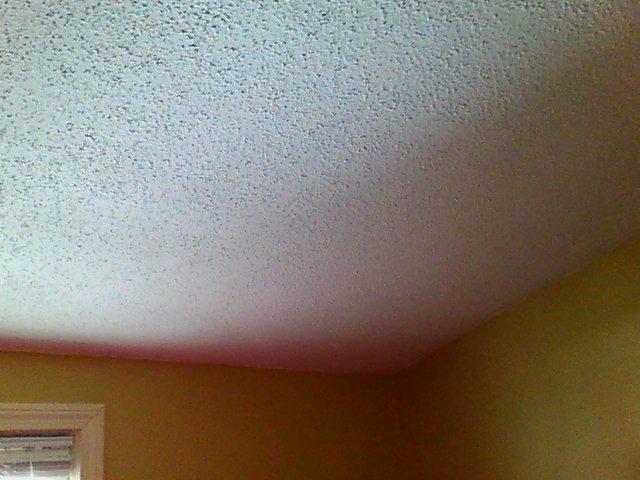 This warm spot on the ceiling turned out to be a critter's nest. 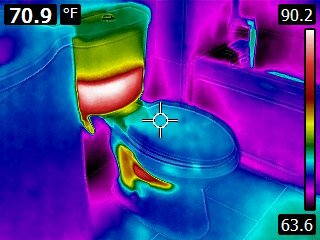 This toilet was plumbed with hot water.